Turmeric is perhaps the most legitimate of the so-called superfoods. It has been extensively studied and researched; and, unlike Noni Juice or Goji Berries, turmeric has been around for centuries and doesn’t have a marketing campaign behind it. Basically, turmeric is just a spice that researchers are studying and discovering the health benefits in it and learning how turmeric may help with common anti-aging conditions. Turmeric is a ginger-like plant whose roots are gathered, dried and made into a spice for its flavor and health benefits. The scientific name of turmeric is Curcuma longa. It is a popular spice in many Indian and Asian dishes and a critical ingredient of curry. The turmeric spice found in grocery stores is the boiled, dried and powdered root of the turmeric plant (picture the ginger you see in the grocery store). Turmeric has a distinct yellow color and can stain clothes (sometimes it is even used as a dye or as food coloring. Personally, I love the way it tastes, especially on well-prepared Indian food (but be careful, some of that delicious food can be high fat). If you are eating more turmeric because of the health claims being reported (see below), be sure that you are using real turmeric in your cooking and not a curry mix. Most of those mixes do not contain enough turmeric. The most interesting nutrient in turmeric is curcumin. 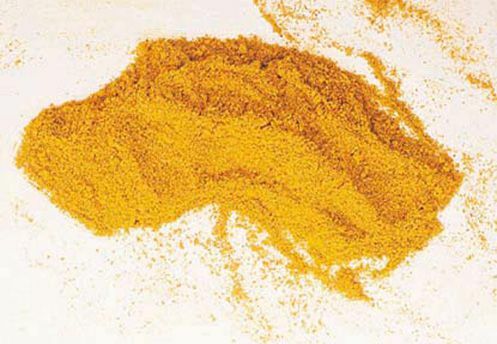 This is the nutrient that has received attention in the media because researchers are interested in curcumin’s possibilities in fighting cancer and Alzheimer’s disease. Conclusive research on curcumin hasn’t happened yet, but there is a lot of potential. The curcumin in turmeric is thought to work because it is a strong anti-inflammatory agent. Apart from curcumin, turmeric contains high levels of iron and manganese and moderate levels of vitamin B6 and potassium -– all vitamins and minerals that are part of a healthy, balanced diet (but nothing so great as to take turmeric just for these vitamins/minerals). You might find turmeric in health foods stores. I have seen turmeric tea (whose label claims it is popular in Okinawa where the people live longer than anywhere else in the world). You might also find turmeric pills as a health enhancer. Keep in mind that in the studies behind these claims, participants weren’t simply eating a lot of curry with turmeric in it. They were given high doses of curcumin (the key nutrient in turmeric) and closely monitored by researchers. For example, in a study on cystic fibrosis, each patient received almost 500 mg of curcumin. They would have to eat almost a full gram of turmeric a day to get that much (that’s a lot of curry!). Many of the studies also look at a combination of high doses of curcumin along with other substances. Basically, this research isn’t nutritional research looking for a new guideline, but pharmaceutical research seeking to produce new drugs based on curcumin. Should I Eat More Turmeric? Sure, it is a delicious spice used in much of the world’s cooking. Eaten regularly, it is possible that you will get enough curcumin to lower your risk of some age-related illnesses. Be sure that your foods is prepared in a healthy way and that there is plenty of turmeric used in the preparation. World’s Healthiest Foods. Turmeric . George Mateljan Foundation.